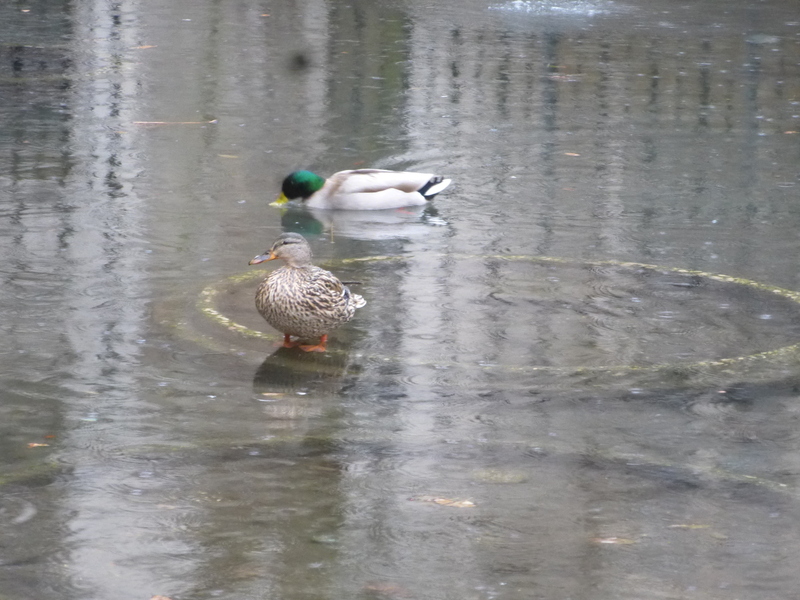 Two mallards (Anas platyrhynchos)—a drake and a hen—showed up at Botany Pond this morning when it was cold and rainy. I took a few quick photos, and, judging from the hen’s bill markings, she didn’t look like Honey. I did feed them, as they were hungry, but that might have been a mistake: if they stay and Honey shows up with her drake later on, there could be Duck Wars. This entry was written by whyevolutionistrue and posted on March 20, 2019 at 8:30 am and filed under ducks. Bookmark the permalink. Follow any comments here with the RSS feed for this post. Post a comment or leave a trackback: Trackback URL. Duck wars! Hmmm… whose side would I be on? Could be a temporary stop-over on the way to ‘their’ stomping grounds. They may have done as much in previous years, pre-Honey. I hope Honey is well. Honey clearly can return, as she had a brood here two years ago, went away, and returned in the spring of 2018 to breed here again. 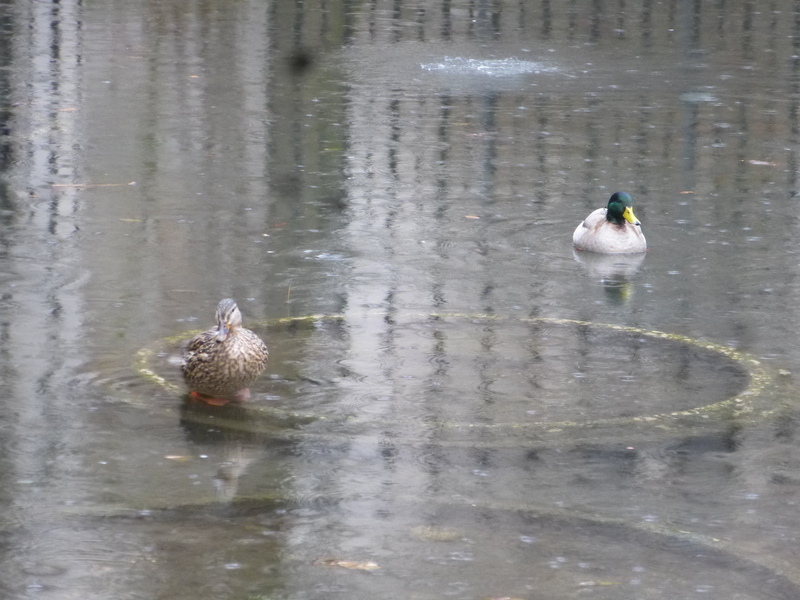 I better not feed today’s ducks, as I want Honey to return and breed here again. She’s fledged 12 ducklings in the two years she was in Botany Pond. Ringing would sure be handy. Even if one or both were ‘F1s’, I don’t think they would co-exist with Honey on this location. The female does not look like she needs feeding. I wonder how she can be so round immediately after a migration. Are you sure neither of them are Honey’s progeny? Don’t know about the drake. But hens start out with a mostly yellow bill. This gets darker and mottled with age. I have no idea. Yes, I should have had the ducks ringed, but that would have freaked them out, and I doubt that anybody would do it. Plus there were eight ducklings in addition to Honey and James. Yesterday I saw some Sandhill cranes with their delightfully annoying sounds they make. Almost as annoying as the sounds bulls make but not quite as annoying. Although both are delightful so don’t get me wrong birds and bulls. One does not want bulls nor cranes mad at one. Birds are just now becoming active in these temperate zones. Migrating north and getting their reproductive cycles kicked into high gear. The males of many species are practicing their songs for mating, while others, like these ducks are already paired. Spring is a great season. When a duck molts do their mandible markings change? Do they change as a duck ages? The drake looks very much like Billzebub!!!!! It better not be. Even though I saved his life, he is an Evil Duck! That pale chest is very unusual for mallards. That was his vestment last year…. Didn’t James have a pale chest, being likely a hybrid? The female looks quite like Phoebe. Ah, I was confusing Billzebub with Frank. This male looks like Frank, not Billzebub. Right! I got Frank and James mixed up. Frank (aka Francis) has a light chest! Could the hen be one of Honey’s daughters returning to what she could consider home?